The first 5 are defined in the pinfunc.h file, where the config value is defined in a user’s DTS file. As an example, consider the following section from imx6ul-pinfunc.h. Column headings are added for clarity. 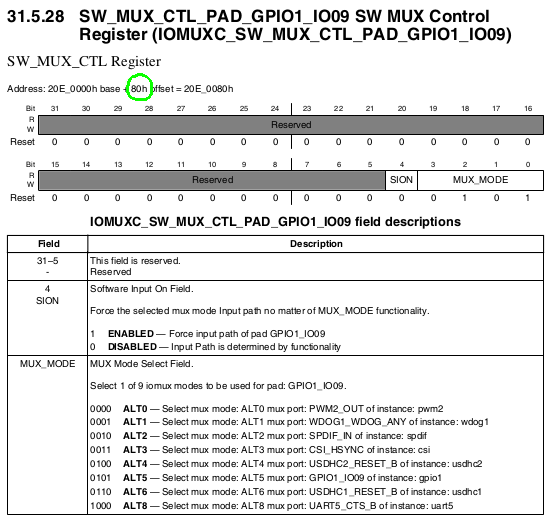 From the i.MX6UL processor reference manual (IOMUX Controller chapter), we can determine the mux_reg is indeed located at offset 0x80. We can also see that the mux_val values match MUX_MODE in the datasheet. The mux_val in the imx6ul-pinfunc.h file also match the MUX_MODE field values in the above register. 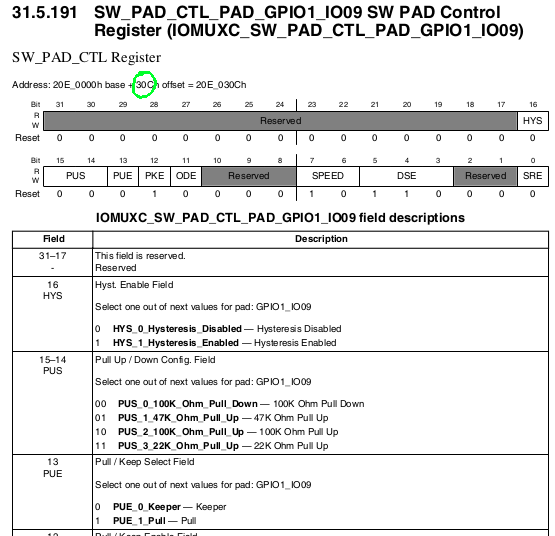 The config register can also be located in the datasheet. Again, we notice that the offset of 0x30C matches config_reg setting. Lets consider the last option listed in the pinfunc file: UART5_DTE_RTS. 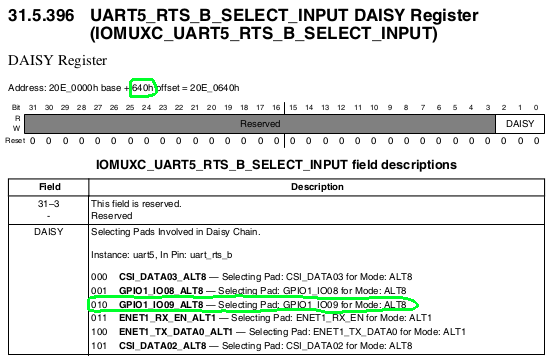 The input register is used to mux a pin to an input function inside the SOC — in this case, the UART5_RTS_B input. We find the input register at offset 0x640 and can see that the input value of 0x2 matches what we would expect in the reference manual. Memory mapped at address 0x76f02000. Memory mapped at address 0x76f0b000. There are additional options that can be configured such as hysteresis, pull up/down, open drain, and slew rate. I/O is very configurable on this device! For GPIO1_9, this would be GPIO9. Another nuance of configuring the i.MX6UL pin mux in Linux is that for GPIO outputs, you need to set a magical bit 30 in the Device Tree configuration as show below. If you don’t set bit 30, it will always read back as 0. The reason for this will be explored in a future post. I did not know much about pinmux on iMX, this article helped me understand it and also enables to tweak it if needed.